No one puts learning in the corner. Those days are gone. If you are a regular reader of this blog, or familiar with the work of forward-thinking learning organization practitioners, social network evangelists and advocates of Connectivism, this news will not come as a surprise. But sometimes I find myself making a cardinal learning professional mistake: Assuming my audience’s knowledge where no evidence exists. So, why isn’t learning just “learning” anymore? Because in today’s modern, hyper-connected world, traditional workplace learning programs have almost entirely lost whatever relevance they may have had as the centerpiece of how people actually learn. Training courses—be they live or asynchronous eLearning courses—should now be the last resort for all but the most stubborn learning needs. Few of us have a specific “job” for very long. I don’t think I need spend many words to convince you that hopping from company to company and even career to career is the new norm. Depending on which statistics you believe, we can expect the typical 30-year-old today to spend the next 35 years of her working life in at least 7 different jobs, and in 1.2 complete career shifts. 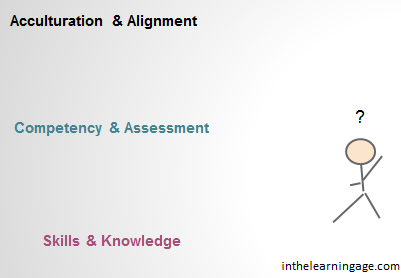 What does that mean for learning professionals? Learning is individual, portable, and an ongoing process. Learning is the job—or should be. People don’t rely on authority for answers anymore. There is no “received” wisdom of how things are done. A recent study (Bersin by Deloitte, June 2014) finds that 60% of L & D professionals report that employees have trouble engaging in corporate learning. That’s because this is based in the assumption that learning is something outside of “regular” work. Learning is the work! Every meeting, project, task and conversation should be thought of as part of an ongoing learning process, and catalogued, shared and honored accordingly. People shouldn’t get paid to “do a job” anymore: Rather, they should be paid to stay current, improve, serve and add value. That, my friends, is learning. What are we (learning pros) doing to put process, skills and culture in place to properly nurture this new reality? Organizational structures are going to go through radical change. Individuals do not serve at the behest of their companies—at least, not for very long. Because of employee portability, workers are in it mostly for themselves. That is actually a good thing! To put it another way, we need to shift our thinking to make that new reality a good thing. People are able to connect with experts in their field from within your organization as easily as with your partners and competitors. Equally, information is plentiful and access to new ideas (good and bad) is nearly limitless. We don’t need gatekeepers or managers to tell us to seek, synthesize and share. Those are simply the skills of the new reality. 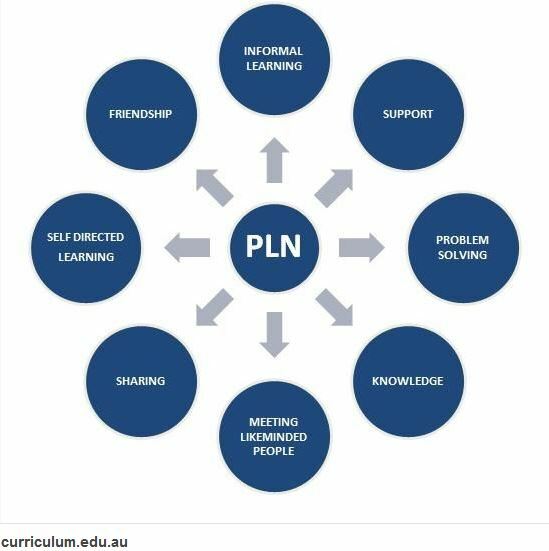 A Professional Learning Network(s) (PLN) extends well beyond an organization’s real or virtual structures. Encourage all to develop these networks for both personal and organizational currency. By empowering folks to digitally practice far and wide, we allow them to bring what they find back into your organization, while freeing them to chart their own professional development and career course. In this new paradigm, L & D professionals are guides, coaches and obstacle breakers. If either manager or employee is having trouble adjusting to this new arrangement, therein lies our opportunity as learning professionals to help our people thrive. Traditional training courses and programs (other than compliance) should be the last resort for the most complex situations. Telling folks to find the answer in a Google search or on YouTube is not an abdication of our professional learning responsibilities, it opens the door to more meaningful passageways of how to learn in the post-industrial era (what I call The Learning Age). What can I learn from my current task, project or activity? How do I document that learning so others can benefit? How do I share what I’ve learned, along with relevant artifacts, outcomes and tools (that is, how do I curate knowledge)? How am I engaging with, and gaining from, what others are learning? Promoting the culture that makes this a practice, a habit, is the L & D task of the moment. Bring learning out of the corner. It is now the lifeblood of your organization. Jane Hart, at the Center For Learning & Performance Technologies (@C4LPT), is a leading contributor to our industry (used in the broadest sense). One of the many contributions she makes is to compile a yearly list of “Top 100 Learning Tools.” She compiles this list by aggregating contributors’ Top 10 lists, which can be submitted in a number of ways including her online form. She also invites folks to make it transparent by blogging or tweeting them. This is the first year I have chosen to do it this way, in the spirit of transparency and #WOL (Working Out Loud/Show Your Work). I encourage you to contribute your list by whatever method suits you, and join me recognizing Jane for her ongoing contributions from which we all benefit. Twitter: I was far from an early adopter, but now it is hard to imagine maintaining my own learning and professional development without it. I learn via my Twitter feed every day. Google Search: I suspect there is not much need for commentary here, other than to say it remains for now the best search for what I look for, and how I wish to find it. That could change in the future. Google Docs/Drive/Sites: For everyday collaboration and transparent cooperation, these have become my go-to tools. There is a lot of room for improvement, but their wide acceptance makes them very useful. WordPress Blog: I write first and foremost to help clarify my own thinking and combine ideas together to see if they stick that way. But, the benefit of knowing that others read this blog and occasionally respond to it makes it a focused learning activity for me. Others feel the same about their “visible thinking” on their blog. MS PowerPoint: We love it. We hate it. We use it, time and time again. I use it to create learning graphics, too – such are my poor graphic design skills. Evernote: I have had a hot-and-cold relationship with Evernote over the years. I am quick to recommend it as a universal tool for clipping, tagging, note-taking and sharing, but I also go a full month at times without touching it. I will say this: In my periods of high productivity I use Evernote a lot. I’m uncertain of the causal relationship, though. YouTube: I find myself drifting to YouTube when I need to see how to do something specific, but also for the general hunt-and-peck drifting to see what I might find. There is so much of… everything! The good, the bad, and the ugly. But when I do find something great, I love that it’s there. Adobe Captivate: It is less and less frequent, but when we do need an animation or software capture with narration/annotation, we use Captivate. I’m not prepared to defend it against competitors; it’s simply the one we use now. LinkedIn: I spend a lot of time thinking negative thoughts about LinkedIn, but the fact remains that I come across useful and thoughtful posts and links there on a regular basis. (10a) eLearning Guild/Learning Solutions Magazine: In terms of my own professional development, the guild remains central to my activities. While I have argued publicly that they drop the “e” (The Learning Guild), the publications, events (DevLearn! ), and community remain vibrant and extremely relevant.